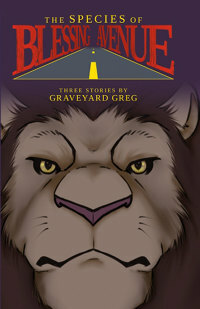 The Species of Blessing Avenue consists of three short stories: “The Species of Alone” and “The Species of Rivals”, published by Smashwords in June and October 2010, and “The Species of Triumph”, published here for the first time. All three feature Israel Kevinson, a hunky and gay teenager who lives on Blessing Avenue. From the start, you couldn’t tell that this was anthro fiction. And it isn’t, exactly. There are references to Izzy’s mothers blonde hair, and to bodybuilding and martial-arts videos with Arnold and Jet Li. It’s not until p. 17 that Izzy turns into a lion – he’s a werelion! Telling you that is technically a spoiler, but the book’s cover by Ninja V sort of gives it away, and anyhow you probably want some assurance by this point that the story is anthro and not just straight human gay fiction with lots of witchcraft and voodoo thrown in. This is not an anthro world; it’s totally human, except for a few weres who are in the closet, and some briefly-seen monsters. Izzy Kevilson likes Joshua, his brainy algebra tutor. Unfortunately, Joshua is straight and only likes girls that way, but a best friend is a best friend. Joshua is into amateur sorcery, and learns enough to become an inadvertent threat to Izzy. So that’s the first story. In “The Species of Rivals”, Izzy is still in lust with Joshua, who has just learned to teleport. That becomes unimportant when a new kid, Quinn, transfers to their high school. He’s black with cornrow-hair, he’s bigger than Izzy, and although he’s friendly enough, Izzy’s lion-predator instinct locks onto Quinn as a rival Alpha -- never mind that Quinn hints at an awareness of Izzy’s and Josh’s secrets. If you have seen the cover of the Smashwords edition of “The Species of Rivals”, you already know what kind of were Quinn is. The teenage three musketeers are two gay bodybuilder weres and a nerdy straight wannabe sorcerer. “The Species of Triumph” is the story that makes The Species of Blessing Avenue an adults-only book. Izzy is now a senior. The appearance on Blessing Avenue of a cannibalistic mass-murderer – “Whatever this thing was, it had tusks like a sabre-toothed tiger, long horns like a bull, red skin, and wicked cat-like claws that I knew were as sharp as they looked. I also found out how it hit like a sledgehammer. That’s because it had something that looked like a giant knobbed club.” (p. 72) -- keys Izzy’s instinct to protect his neighborhood, as it also brings the book’s subplot of Izzy’s rivalry with his father for alpha status within his family to a head. The Species of Blessing Avenue is a slight but enjoyable coming-of-age moment in a gay highschooler’s life, with plenty of sorcery and were-feline transformation thrown in. The 'adult' content is minimal, and with so much feline fur that you can hardly tell. For only $9.95, it’s money well spent. Like many nowadays, Greg raised project funds on Kickstarter . . . though not to the extent of a sequel anytime soon. Fred, you made my day with this review. Enough said.